Texarkana, TX – Carson McCarver, Texas High School Senior, has been named a Semifinalist in the 2019 National Merit Scholarship Program. An estimated 16,000 students from a pool of 1.6 million entrants were chosen for this honor based upon high school academic record, participation in school and community activities, demonstrated leadership abilities, employment, honors and awards received and highest scoring in the 2017 Preliminary SAT/National Merit Scholarship Qualifying Test (PSAT/NMSQT). McCarver will now move forward to the Finalist selection to continue in the competition for some 7,500 National Merit Scholarships worth more than $31 million that will be offered next spring. He is a member of Mu Alpha Theta Mathematics Honor Society, National Honor Society and Tri-M Music Honor Society. 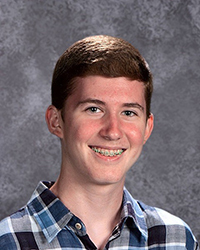 McCarver was selected for the NASA High School Aerospace Scholars program and attended the on-site experience in July 2018. He has earned Academic Achievement Awards in Spanish II and III Pre-AP, Pre-Calculus Pre-AP, Chemistry I Pre-AP and the Award of Excellence in Math. As a cellist in the Texas Tigers Orchestra, McCarver earned TMEA All-Region recognition during the last two years and scored 1’s in Class II Solo, Class I String Quartet and Class I Piano Trio in UIL Solo & Ensemble. He also serves as a cellist in the Texarkana Youth Symphony. McCarver was a Junior Counselor at Brookhill Ranch Summer Camp, is a High School Helper for the Totus Tuus Summer Program at Sacred Heart Catholic Church and serves as a Sunday School Teaching Assistant at First Baptist Church – Moores Lane.